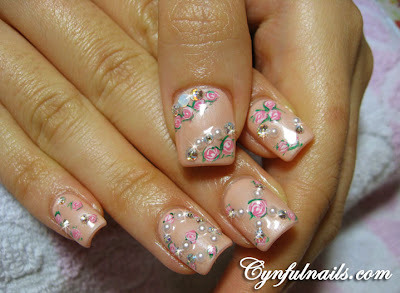 Cynful Nails: Bridal nails - gel and acrylic. Bridal nails - gel and acrylic. This is marbelling with gel colours. Kinda simple but I love the colour combination. Acrylic extension with gel colours. Peach pink tips with painted roses and lace. Gel nails. Simple french nails with painted black ribbons (inspired by Clara) and a full bling ring finger. Gel nails. A clean set of nails for her wedding photoshoot. Acrylic extension with gel colours. Loving the lace design here. Very pretty! Clear acrylic extension. Painted the lace details on the tips. Acrylic extension with gel colours. The white and dusty pink colour combi looks very country style. Acrylic extension with silver glitter tips. 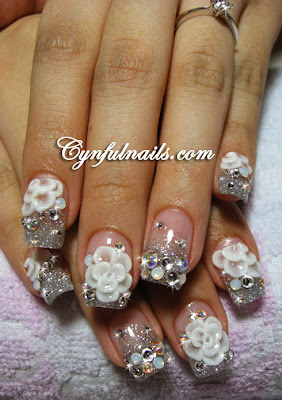 White embossed flowers and crystals make it look very bridal! Acrylic extension with gel colour. Simple with painted roses, pearls and crystals! Gel nails. Classic french lace and red roses painted on white tips. Nice. You're really an artist! I love these manicures!